As a California Closets Design consultant, my goal is to help clients find the best storage solution for their home. By listening to their needs and understanding their lifestyle, we can work together to create the perfect layout for each project. I truly believe that a space cannot be beautiful if it is not functional. Problems with storage? Mountains of clothes piled in a corner? Finding yourself late once again because of a closet that is not functional? Or maybe it's time for refreshing your wardrobe or home office to increase productivity? I can help you! At California Closets, we pride ourselves on our service to outfit the space according to the client's specific needs, always working with the latest design trends and with what's new in the storage solution industry. We have been Recognized as: -Best of Houzz 2016, 2017 and 2018 -2015 Interior Design Society #Impact Award for Charitable Work -National Association the Remodeling Industry (NARI)’s coveted Contractor of the Year (CotY) Award 2014 -Angie's List Super Service Award for 2013, 2014, 2015 -Best of Huntington Station, NY Custom Closet Design & Construction Award 2014, 2015, 2016 Our Charitable Community Work Includes: -Veteran's Home Bathroom Remodel in West Hempstead, NY (with Karen Ferreyra) -Closet designer for Ronald McDonald House projects 2014 -Storage solutions for Family & Children’s Services Mercy First Residence We are Board Members for: -The Interior Design Society, Long Island Chapter (IDS, LI) & -National Association of the Remodeling Industry (NARI), Long Island/NYC Chapter Are you looking to maximize space while maintaining your personal style? --Reach out and ask us to design a beautiful custom closet system to fit everything you need in the space available. Are you designing a home office or entertainment center? --We can design a stylish custom cabinet and filing system, or a unique media center to fit any TV or sound system you want. From the attic to the basement or garage, we'll help you enjoy the fullest storage potential of your home. Our customers and industry partners speak highly of our friendly and knowledgeable designers. We provide free consultation sessions and work with you to develop a design that meets both your needs and your personal style. Our installers are clean and courteous, and respect your space as much as you do. If you want more information about custom closet solutions, or just some organization tips--we have a host of resources and a blog filled with useful info to help you bring your project from a dream to a reality. Since 1992 Anthony's Closets, Shower Doors & More has been providing custom organizing solutions and shower doors to builders, remoderlers, interior decorators & homeowners. I am an honest and compassionate person who enjoys helping my clients create a space that embodies their personality and brings them peace & JOY!! I am the first certified KonMari Consultant in CT and assisting others in organizing their homes once & for all is exciting ! I’m also a graduate of the Staging Diva home staging program and love to help set the “stage” to sell a home quickly and for the selling price- no price reductions! Lastly, I have always had a eye for style and a passion for home decorating on any budget. Interior Specialties Group offers the latest trends in organizational systems, glass shower enclosures, custom kiosks, custom millwork, window treatments and division 10 specialties. Along with LEED certified solutions and a vast knowledge of Value Engineering “ISG” has the experience to become your reliable service partner. Exceeding customer expectations…. Since 2004 Carl Iaccarino has been providing clients with unsurpassed quality custom Design & Installation spatial organization for homes, garages, and offices.Residential or Commercial. Although our name is California Closets, we are locally owned and operated and have been offering Long Islanders innovative solutions to their storage and workspace challenges for 25 years. California Closets Long Island serves customers in Suffolk County from its conveniently located Ronkonkoma facility. Your storage solution is designed and fabricated on our premises, right here on the Island. There’s Nothing Standard About Us The system we design will be part of your daily life for years to come and your satisfaction is of paramount importance. When you work with us, you can be assured that we will provide a closet or workspace solution that is tailored specifically to your needs. No out-of-the-box or pre-fab system can come close to matching the level of customization, beauty, and efficiency of a California Closets installation. We work with a vast array of innovative materials, finishes, and accessories, but our Design Consultants are what set us apart in the industry. Our Consultants meet with you to learn about your needs and apply their knowledge to create a storage solution that is uniquely yours. Their singular goal is to give you everything you need and nothing you don't. Think Outside the Box There is a big difference between pre-packaged, off-the-shelf storage systems and a California Closets storage solution. We design your system to maximize every inch of space. That is simply not possible to do with a store-bought system. 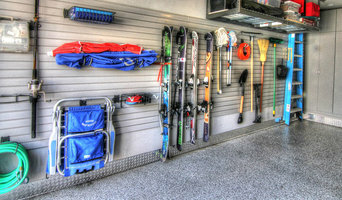 Appearance is another area where California Closets excels. We utilize a wide variety of finishes and accents to blend your system perfectly into the existing decor. Our design consultants can create a dramatic new focal point in the room or make the system harmonize so well with existing architectural details that it appears to have always been there. Our process begins with learning about you and your expectations. When you request a free consultation, we do far more than take measurements. Our Design Consultant will ask you all manner of questions about your space, its usage, and your lifestyle. The Consultant will then transform what they learn into a design concept that is aesthetically and functionally outstanding…and created just for you. No two installations are alike. Before hiring a professional organizer, consider exactly what you need. Have you just moved into an East Hampton, NY home and have no idea where to put everything? You may want to consider an organizer who specializes in room-by-room space planning or estate organization. Perhaps you’re faced with a tiny closet and an overflowing wardrobe. In that case find a professional who focuses on closets to help you get back on track. Also consider the types of objects that need organization. Are they items like books, family photos, files or collections? You’ll want a professional organizer who has experience designing custom systems with East Hampton, NY companies that will best fit your needs. Find a professional closet and home organizer on Houzz. Narrow your search in the Professionals section on Houzz to East Hampton, NY closets and home organization.